MOLITOR Avocats à la Cour - Social elections on 12 March 2019: do they concern you? 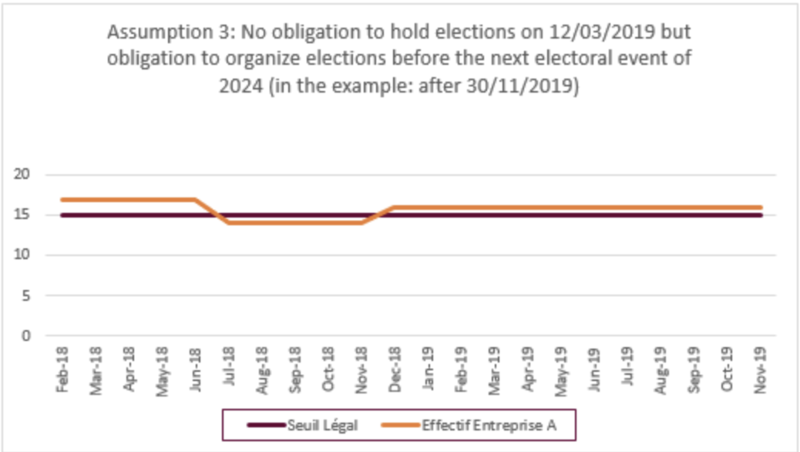 The date of the social elections has been set for 12 March 2019 by ministerial decree of 3 December 2018. As the posting of the notice of election within the company has to be done by 12 February 2019 at the latest, it is important to recall the principle governing the obligation to organize these social elections. Any business, regardless of the nature of its activities, its legal form or its sector of activity, which has at least 15 employees between 1 February 2018 and 31 January 2019 (i.e. during the 12 months prior to the first day of the month of the posting which announces the social elections), must appoint staff delegates, the number of which depends on the number of employees in the company during that period. How is the threshold of at least 15 employees calculated? Managers (managers or administrators) who have a contract of employment to carry out only distinct technical functions. Directors (directors or managers) who are not also employees of the company. How is the 12-month reference period determined? For the company to have an obligation to appoint staff representatives, the number of employees taken into account in accordance with the above points must be at least 15 during a 12-month reference period preceding the first day of the month of the posting announcing the social elections. In this case, the reference period is between 1 February 2018 and 31 January 2019. A company must organize social elections on 12 March if it has employed at least 15 employees continuously between 1 February 2018 and 31 January 2019. The number of employees has to be at least 15 throughout this period, otherwise the company does not have to appoint staff representatives. Consequently, if a company A has 17 employees between 1 February 2018 and 30 June 2018, then 14 employees between 1 July 2018 and 30 November 2018, and finally 16 employees from 1 December 2018 to 31 January 2019, it will not have to organize social elections on 12 March. Company A will, however, need to appoint staff representatives (and therefore to organize ad hoc elections for these purposes without being able to wait for the next election in 2024), if it continues to employ these 16 employees (or at least 15 employees) without interruption over an uninterrupted period of 12 months - in our example above until 30 November 2019. Mémorial A n° 1104 of 7 December 2018: Ministerial Decree of 3 December 2018 fixing the date for the renewal of staff delegations for the period 2019 to 2024. If the working hours are less than sixteen hours a week, the total of the hours entered in the employment contract is divided by the legal or contractual duration of work (Article L.411-1, point 2 of the Luxembourger Employment Code).